Ordering links will go live on Monday at Thunderstorm’s site. Watch this space for the link! There are hundreds of thousands of acres of unexplored rainforest and mountainous terrain in the Peruvian Andes. Civilizations have thrived and perished in complete isolation from the rest of the world, and even now we are still discovering the hidden ruins of once great societies. An exploration party led by Hunter Gearhardt is dispatched from Pomacochas in an effort to penetrate the mysterious cloud forest. After one final satellite communication, he and his entire team vanish without a trace. No one leaves the rainforest alive. This entry was posted on March 28, 2012 by evilanche. It was filed under Uncategorized . I ordered Burial Ground, and instead was shipped “Lights Out” and am so angry right now. 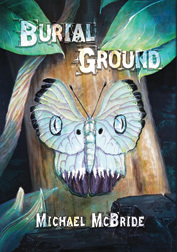 I was looking forward to reading Burial Ground and was patiently awaiting it’s arrival. I left Paul an email, but according to his website, he won’t be checking it due to publishing orders. Should I file a claim with Paypal? I am so disappointed. I totally understand your frustration. I have no doubt it was an accident. An unfortunate one, obviously, but Nate’s a good guy and an excellent writer. And Paul’s one of the good guys in the business. I have no doubt he’ll fix the issue. If he doesn’t get this resolved quickly enough for you, I could probably send you one of my copies and let Paul square it with me. In the meantime, can I send you a digital copy to tide you over? Paul sent out a copy this morning !!!! And yes, I knew it had to be an accident, but was so disappointed when I opened the box. You don’t have to send me a digital copy. The hardcover on it’s way is enough for me. Wouldn’t want to spoil the anticipation of reading and turning every page !!! I look forward to your next hardcover edition !!! And Thunderstorm Books is A+ on my list of publishers knowing that Paul is one of the good guys !!! OMG…I tried to read this as fast as they were trying to escape !!!! Awesome! I’m thrilled you enjoyed it! I’m glad not to have disappointed. After the hoops you had to jump through to get it, I would have felt terrible.